July 11, 2017 – Hughes Hubbard & Reed is pleased to announce that Jim Dabney, co-chair of the firm's Intellectual Property practice group, has been named to the National Law Journal's Intellectual Property Trailblazers list for the second consecutive year. 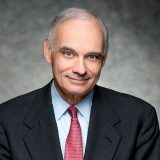 In its profile of Dabney, which appeared in The National Law Journal's July issue, the publication noted that he persuaded the Supreme Court to effect important changes in IP law. Dabney has argued four cases before the U.S. Supreme Court, including representing TC Heartland against Kraft. Fairly early on with TC Heartland, he saw that the Federal Circuit’s treatment of patent venue was in deep tension with Supreme Court precedent. He represented TC Heartland throughout the litigation. On May 22, the Supreme Court ruled unanimously for his client, reversing the Federal Circuit’s ruling. Dabney is co-head of the firm’s Intellectual Property and Technology practice group. He specializes in contentious matters involving patents and other forms of intellectual property. He is also an Adjunct Professor of Law at Cornell Law School and a Life Member of the American Law Institute.